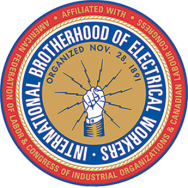 The International Brotherhood of Electrical Workers (IBEW) was formed in 1891, when ten electrical workers met in St. Louis, Missouri, to form the first national union for the advancement and safety of those practicing a challenging and dangerous craft. From their efforts came a legacy of pride, skill, and dedication: the foundation of the IBEW. With hope and determination, they created an effective and respected union that has contributed to the well-being of men and women in all aspects of the industry for more than a century. The IBEW represents approximately 750,000 active members and retirees who work in a wide variety of fields, including utilities, construction, telecommunications, broadcasting, manufacturing, railroads, and government. The IBEW stands out as the largest American Building Trades union with members in a diverse variety of skilled occupations. United through more than 800 local affiliates throughout theUnited States and Canada, the IBEW has additional members in Puerto Rico, Panama, Guam, and Saipan. The IBEW remains one of the largest electrical unions in the world, and its members’ wages, working conditions, and benefits continue to provide a solid living and a middle-class existence for hundreds of thousands of families. More than 100 years after its founding, the goal of the IBEW has remained the same: to promote excellence in the electrical industry and improve their members’ lives.